- Appeared to Blessed Juan Diego in 1531. - Patroness of the Americas, the unborn. 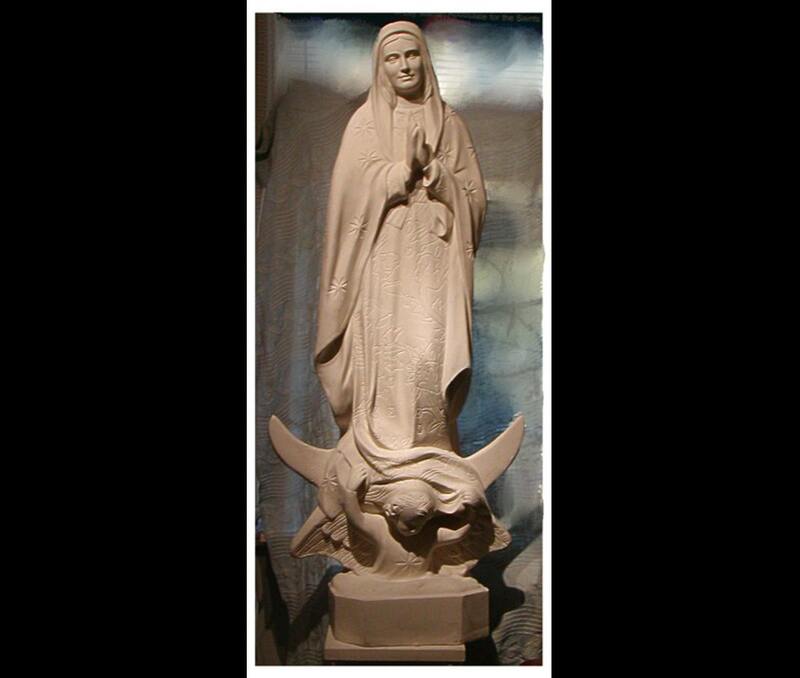 This 52/62" fiberglass statue features Our Lady in a prayerful posture standing on the moon, outshining the sun behind her with the support of an angel. 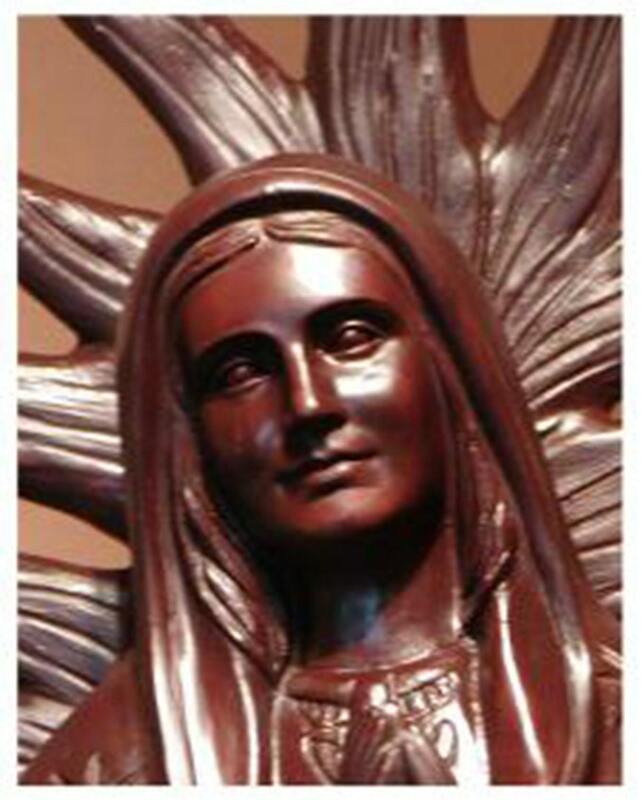 The sun rays are included with this statue, it is shown in the photo of the brown version of Our Lady of Guadalupe. NOTE: Each statue is made individually, not mass produced. Please allow 5-8 weeks for delivery, often sooner depending on orders in work shop at the time. Due to the expense of shipping, we do not accept returns/exchanges unless the statue was damaged during the shipping process. Heavenly Saints is a Roman Catholic Lay Apostolate for the Saints inspired by our Blessed Mother Mary, and under her patronage as Our Mother of Good Counsel, together with Saint John Neumann, Saint Rita of Cascia and Saint Damien deVeuster of Molokai. • WEIGHT - Fiberglass is light. Even the largest sizes can be easily carried by one or two people. Concrete requires a crane for placement at the site for the larger sizes. • SHIPPING - Fiberglass is light. It costs considerably less to ship than concrete statues. • PRECISE - Fiberglass pours as a liquid and therefore reflects all the fine details of the mold. Concrete is thick and grainy and does not penetrate into the fine details of the mold well. • STRENGTH - Fiberglass is strong. It is reinforced and is the same material used to make boat hulls which withstand shock and the elements without breaking. Although concrete is durable for outdoors, it will break into pieces if hit or knocked over. • COST - Fiberglass is a much less expensive medium for outdoor statues than is concrete. • DURABILITY - Fiberglass will not degrade, erode or crumble over time in the elements like concrete tends to do. • AVAILABILITY - Concrete statues take longer to prep, produce, cure and finish, where the fiberglass process allows for quicker turnaround. WHAT SETS IMAGES OF HEAVEN FIBERGLASS STATUES APART? • FACES - Not afraid to show close-up highly detailed photos of our statue faces. Proprietary painting and finishing techniques used in producing stunning life-like faces and eyes. • WORKSHOP - Not mass produced or imported from China, South Korea or Hong Kong. All statues individually hand crafted, sanded, sealed and painted in-house at the time of order by our own artisans. • EXCLUSIVE - Available only through our website, not catalogs or stores. • COLORIZATION -Painted in a wide variety of lovely pastels and soft tones, not harsh primary colors. • TECHNIQUE - Natural color versions hand painted with fine brushes and artist pencils for sharp lines of demarcation, not air brushed with blurred overlapping colors. • PRODUCTION - Cast and embellished on site with poly resin and premium fiberglass webbing. • FOCUS - Images of Heaven makes only religious statues - you’ll never see birdbaths, buddahs, gargoyles, gnomes, fountains, etc. To ensure that your beautiful fragile statue gets to you safe and sound, we pack it well for you. First we wrap your statue with good quality bubble wrap, and then your statue is placed in a large sturdy box filled with good quality packing peanuts. We will replace your statue only in the unlikely event that it arrives broken or otherwise damaged during the shipping and delivery process. You will return the damaged statue to us (at our expense). After it arrives and we confirm the damage we will make another statue of the same personage and size and ship it to you as a replacement with no additional expense to you. There is a 15 day return policy for PLASTER STATUES only. Buyer has to pay for the shipping.